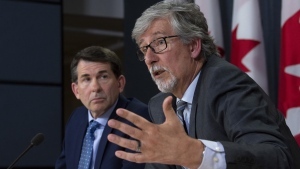 WASHINGTON -- The foreign ministers of Canada and the United States have jointly condemned the racist-fuelled violence in Charlottesville. 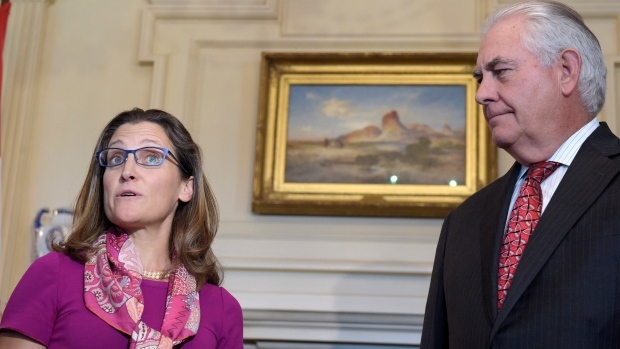 Chrystia Freeland and Rex Tillerson made it the focus of their public remarks in a brief exchange with reporters today. Freeland visited the secretary of state in his office while she was in Washington for the opening round of NAFTA talks. Tillerson opened his remarks by noting that Canada and the U.S. are close friends with shared values -- values that include freedom and tolerance. He said he wanted to add his condemnation over what happened in Virginia, where white supremacists gathered and an anti-racism protester was killed when a car plowed into a crowd of people. Freeland offered her condolences, along with what she called an unequivocal condemnation of racist hatred. She said it's important to speak out publicly against acts of hatred -- to which Canada, she noted, is not immune, citing the case of the recent Quebec City mosque massacre. Both ignored a shouted question about whether they agreed with the controversial nature of how the events were addressed by U.S. President Donald Trump.